Appreciating, protecting and improving urban nature sites. 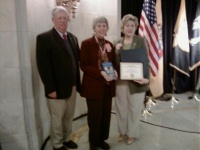 Patricia Hilliard, writer of the Wild Birds in the Parks of Hudson County was recognized and awarded for her work in creating the booklet that made everyone of Hudson County aware of the nature in our own back yard. Funding for the booklet was provided by Hudson County Office of Cultural & Heritage Affairs/Tourism Development and Hudson County Improvement Authority. When asked why she created the booklet, Hilliard stated, "Many people in Hudson County didn't know about the birds that were right here. I wanted them to understand that nature isn't someplace else, we have it here in Hudson County too." The booklet tells about those parks in Hudson County that host wild birds that can easily be viewed from the boardwalks or trails. It gives information on how to get to the parks and what can be seen there. Hilliard has spent over 15 years as a bird watcher in Hudson County. 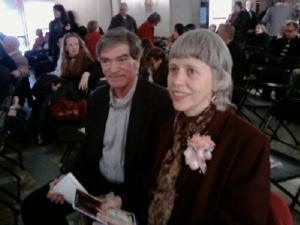 She is a member of the Sierra Club, NJ Audubon Society and the Hackensack Riverkeeper. We hope to be able to offer the book online from this site in the near future.